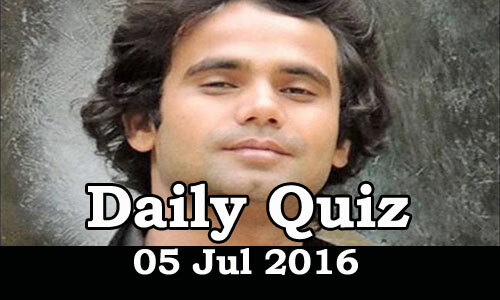 Daily Current Affairs Quiz 05th Jun 2016, Current affairs and GK questions on National and International are listed in the Quiz. Candidates those who are preparing for Government Jobs and IBPS/SBI/RRB exams and all other exams can use these questions. 1. Who among the following ministers was elevated to the rank of Cabinet Minister in the Prime Minister NarendraModi-led NDA government? 5. NASA's unmanned Juno spacecraft on July 5 began orbiting which planet? 6. Who has become the first Indigenous woman elected to the House of Representatives (lower hous[e] of the Parliament of Australia? 7. Name the Indian swimmer who has won 8 medals including 3 golds at the IWAS (International Wheelchair and Amputee Sports) U-23 World Games in Prague. 8. Which state government announced a 100-day plan for the development of agriculture, urban infrastructure, and veterinary sectors in the state? 9. Which state police has launched a 24-hour helpline for people to report incidents of cow smuggling in the state, where cattle slaughter and beef sale are already banned. 10. Who among the following was elected as the speaker of Karnataka Legislative Assembly? 11. In which state is the Jawaharlal Nehru Port (JNPT) headquartered? 12. Which state was the top tourist destination in India for the second consecutive year in 2015, according to data by the Tourism Ministry? 13. Annu Rani sports person from India plays which sport? 14. Who is going to serve as the association's first president of Olympians Association of India? 15. Name the first actor to play the role Lois Lane on the Adventures of Superman television series died.